Editor’s Note: Emma Cowan has been working in agriculture all her life after growing up on her family’s beef and soybean operation in Brazil. Her corporate career, which spans more than 25 years, includes senior positions at Rabobank, Syngenta, and Monsanto. Forming agribusiness consultancy Cardy-Brown and Co in 2007, Cowan now advises investors with bespoke insight and analysis. Her current clients include fund management firm Sarasin where she advises on the Food and Agri Opportunities Fund. Is it possible that genetically modified crops are on the road to redemption in Europe? It looks like Bayer CropScience might think so after its recent offer to acquire Monsanto, the US agribusiness that’s almost synonymous with GMO. This week, the Royal Society, a fellowship of many of the world’s most eminent scientists and the oldest scientific academy in continuous existence, called for the ban on GM crops by European countries to be reassessed. Every week there seem to be new evidence or media articles about the benefits of GM technologies in agriculture. The rise of gene editing tools, which are not technically classed as GM, is also helping to promote positivity around the sector. Since the arrival of GM seeds on the agricultural scene, chemical use has fallen by 37% in volume, and crop yields have risen by 22%, according to a ‘Meta-Analysis of the Impacts of Genetically Modified Crops‘, a report written in Germany in 2014. GMO maize, soybean and cotton varieties command 90% of US planted farmland and similar acreage is dedicated to GM crops in South America and Canada. Europe still severely restricts the planting of GM crops and the controversy surrounding GMO makes Monsanto intensely unpopular in Europe and especially in Germany. Bad news sells and Monsanto has been its own worst enemy adopting heavy-handed communication styles in the past. Monsanto would be as welcome in Germany as Trump will be in London later this month! This seems to have little impacted Bayer, the German multinational chemical company, which recently offered to acquire Monsanto to $62 billion in cash. This offer implied a large premium on Monsanto’s somewhat languishing share price but, in a response which seems predictable, Monsanto has pushed back to see how much more it can get. Bayer’ share price has fallen 11% since the offer for Monsanto has come to light. This deal is still very much in the making; it makes strategic sense for both parties, but at the moment relies on Monsanto giving up some ego. Firstly, debt is currently extremely cheap with 0%, or close, financing costs. This makes it an interesting timing to stretch oneself with a big, aggressive M&A move. Equity analysts are also stretching themselves to give their opinion on what the payback period would have been if Monsanto had excepted Bayer’s initial offer. Today’s estimation is that the return on invested capital would not exceed the cost of capital until 2023; figures Werner Baumann, Bayer’s CEO, will refute. What happens when interest rate rises and Bayer’s cost of financing gets heavier is another difficult question for Bayer. Are they betting that interest rates won’t rise? Is Bayer also betting that Europe will eventually give in to the world of GMO technology in their seeds? The data in support of GMO technology seems to be starting to gain versus the anti-GMO school of thought. And, if successful, Bayer could wipe clean the negative connotations and reputation of Monsanto by dropping the name. It would then to be in an excellent position to access European markets with GMO seeds via their current crop protection distribution network. Similarly, Bayer products could gain market share in the Americas where they have not typically been market leaders. Monsanto’s Climate Corp, the digital farm management platform it acquired for $1 billion in 2013, has also been mentioned as of interest to Bayer, which is slowly growing its own digital platform after acquiring Zoner and proPlant. Monsanto seems to have tried in vain to change its reputation from bee killers to bee saviours, but few green-oriented European consumers seem to be buying it. Bayer offers a channel into Europe for Monsanto technology under a different brand name. More and more, the seed and crop protection industry ‘bundle’ their products as complete crop ‘solutions’, combining specific technologies. The opportunities to ‘bundle’ together Bayer crop protection with Monsanto seed products could be profitable to produce synergies and provide a new channel for growth. Clearly the crop input industry has been acknowledging the future of the crop protection industry towards building plant defences via gene manipulation either through traditional breeding, modifying genes, or editing them. The most rapid growth in agriculture research and development has been focussed on crop seed and biotechnology where annual R&D spending increased from about $1.5 billion in the mid-1990s to nearly $3.5 billion in 2010, according to ERS and USDA data. Crop protection chemical R&D investment, by comparison, has not really moved since 1994 when it stood at around $2.9 billion. With this the acquisition of Monsanto, Bayer is betting on seeds and seed genetics to provide a future of growth and to develop its access to global markets. M&A is definitely the flavour of the moment in the crop technology scene in the race to be the biggest and the best. Dow and DuPont are merging and will spin off a very large agri-focused company; ChemChina is in the process of acquiring Syngenta with minimal Swiss feathers ruffled in the short term. 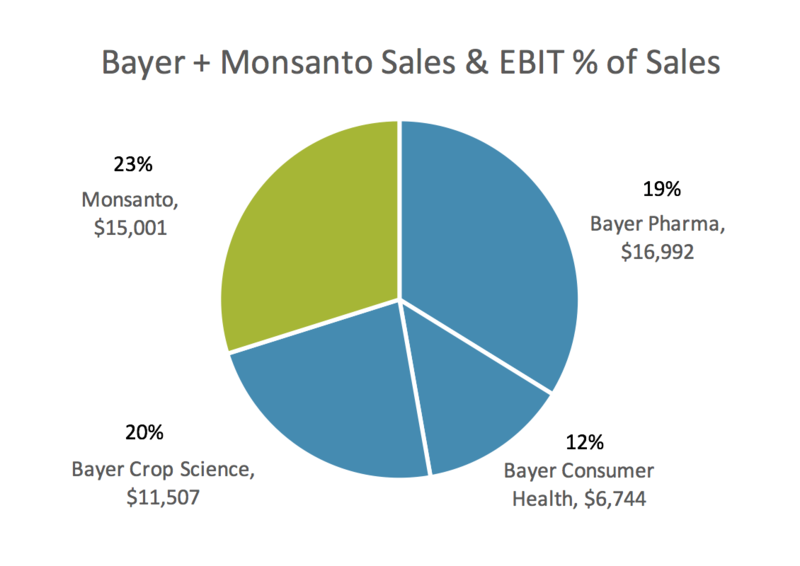 If Bayer takes Monsanto, three companies will control half of the world’s seed sales. This industry is not widgets or internet marketing space; this is food security and is therefore highly emotive to governments, not least China. China’s ChemChina’s acquisition of Syngenta is said to be mainly motivated by Beijing’s forward planning to control the world’s food supply for their huge population. The oligopolistic outlook for this market is making those that can hurry to consolidate. With three imminent industry-shaping moves in short succession, the industry regulators are likely to take their time in approving all three. Antitrust officials are likely to tear all three strategic moves apart. They will evaluate the overriding impact of the simultaneous creation of three extremely dominant companies and the knock-on impact that would have on other related segments both on the supply side — research laboratories — and market side — farmers. There may not be as much cause for concern as they think: the degree of overlap between Monsanto and Bayer is actually rather low as is that of Syngenta and ChemChina. But, it will be an extremely aggressive marketplace going forward if the regulators allow all these mergers and acquisitions to happen. Source: Based on company announcements for 2015 results and ChemChina data is from 2014. Farm incomes are likely to remain tight for at least the next five-year, so the only way for the big agribusinesses to maintain their margins is to look for synergies via consolidation. The only way to grow is through gaining market share from competitors. Monsanto has been, until recently, thought of as the aggressor rather than the prey in possible M&A deals. After its failed bid to buy Syngenta, it has lacked options to catch up with the new league of DowDuPont. Monsanto could aggressively acquire a string of medium-sized companies however, this would be time-consuming and hugely complicated to gel into one effective entity. The offer from Bayer would get them to the top of the league, but at the cost of their identity. In the current negotiations, it would not be surprising if the acquisition attempt of Bayer began to look more like a merger or even a backwards takeover where the acquired becomes the dominant management team in the emerging company. The combination of Bayer CropScience together with Monsanto makes a lot of sense and will create an industry leader. The lure of that is too big for either party to walk away from. The below charts offer a glimpse at what future merged companies would look like in sales and EBIT figures, disregarding accounting details. Note the sudden dominance of the agri-sector divisions. ‘BaySanto’ would represent approximately 52% of Bayer’s revenue and approximately 60% of the company EBIT, according to rough estimations. Source: Company financials 2015. n.b. Excludes sales of animal health division and ‘others’. Also Note that EBIT % is the EBIT as a % of Sales within the division. With the formation of BaySanto as a market leader, Syngenta will be once again left behind in the seed market. In recent history, Syngenta has consciously set out to acquire companies in order to build its seed market capacity, but the Dow DuPont merger and the possibility of BaySanto will leave them once again as the small fish in the large pond. With market regulators breathing down their necks, Dow and DuPont could be forced to spin off some seed entities, however, presenting new acquisition targets. The race to consolidate will undoubtedly continue. What do you think? Is Bayer betting on GMO going global? Are there any other options for Monsanto? Get in touch with Emma Cowan here.